GhanaVeg, an initiative of Netherlands Embassy, has provided a business platform to ensure that the commercial vegetable sector works effectively to meet local and international demands. 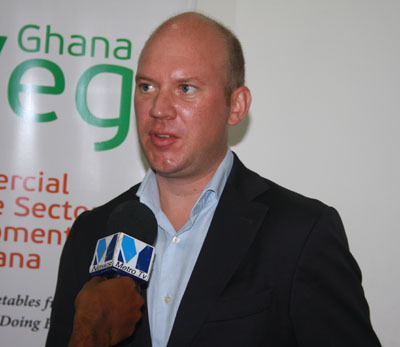 According to Joep van den Broek, Programme Leader for GhanaVeg, the business plan, which includes a Business Opportunities Fund and Research and Development (R&D) Co-Innovation Fund, was implemented because of the available market for produce on the local and international front. The Business Opportunities Fund is a 50 percent matching fund aimed at mobilizing innovations and investments in the vegetable sector while the R&D Co-Innovation Fund is also a 50 percent matching fund to provide applied research for companies to address specific agronomic or technical bottlenecks in the vegetable sector. Over the years, some products from Ghana have been banned in the largely lucrative European Union (EU) market due to some poor agricultural practices. Speaking on the theme, ‘Demand Driven research for a Private sector-led Growth in Ghana’s vegetable Sector’ at forum in Accra recently, Mr van den Broek said research is crucial in addressing the challenges that operators in the commercial vegetables sector face in terms of pests, diseases, soil and climatic change. Hanson Arthur, Fund Manager and Monitoring Expert at GhanaVeg, disclosed that the proliferation of malls in Ghana had increased demand for vegetables on the market. “What we intend to see is a more competitive sector both locally and international. What I am seeing is a sector that is picking its nose up and we hope that with the conditions that GhanaVeg brings and also the interventions of others, farmers can take advantage of it and grow their businesses. “Right now, the sector is ripe for a take up so if farmers take advantage of the demand to fill these lines by the supermarkets, then we can say that domestically it is big,” Mr Arthur said. He added that his outfit was ready to support the private sector to offer extension services in order to complement the existing national extension landscape to help address some of the challenges in the sector. Project Development Specialist, Adu Mensah, also entreated research institutions to harness their intellectual resources to improve the sector. European countries invest so much effort, logistics, time and resources into agriculture but the reverse is what we see in Ghana and Africa at large, Mr Mensah said. “We have to move from the ancient way of farming and see agriculture as a business venture. This is the only way we can make progress,” he said.